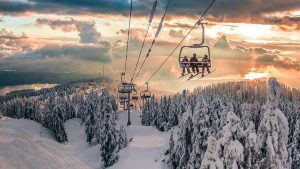 North Vancouver (BC), Canada – Beginning this December, Mt Seymour ski resort will be offering a direct shuttle service to guests coming from the Lower Mainland and East Vancouver. The new East Vancouver shuttle service, with a pickup location located opposite the Rupert Skytrain Station, is scheduled to operate seven days a week with three daily pickups and drop-offs for the 15-mile drive to Mt. Seymour. The shuttle service targets skiers and snowboarders from East Vancouver, New Westminster, Coquitlam, Port Moody, Burnaby, Pitt Meadows, Surrey and Maple Ridge. “We are thrilled to offer this shuttle service to guests that either do not own a vehicle or choose to travel sustainably, especially with the opening of the new Evergreen Line in December,” says Eddie Wood, General Manager of Mt. Seymour Resorts Ltd. The loading zone will be located across from the Rupert Skytrain Station on the Millennium Line, at the passenger zone outside the Liquor Distribution Branch. Scheduled pick up times will be available on the Mt. Seymour website in time for the start of the ski season in December. The resort plans to offer three daily pickups (morning, midday and afternoon), as well as three daily drop-offs (midday, afternoon and evening). The shuttle service will cost C$8 each way or C$99 for an East Vancouver Shuttle season pass, available when purchasing a ski area season pass.